For other uses, see General Mills (disambiguation). General Mills, Inc., is an American multinational manufacturer and marketer of branded consumer foods sold through retail stores. It is headquartered in Golden Valley, Minnesota, a suburb of Minneapolis. The company markets many well-known North American brands, including Gold Medal flour, Annie's Homegrown, Betty Crocker, Yoplait, Colombo, Totino's, Pillsbury, Old El Paso, Häagen-Dazs, Cheerios, Trix, Cocoa Puffs, and Lucky Charms. Its brand portfolio includes more than 89 other leading U.S. brands and numerous category leaders around the world. The company can trace its history to the Minneapolis Milling Company, incorporated in 1856. 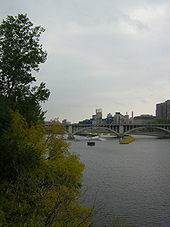 The company was founded by Illinois Congressman Robert Smith, who leased power rights to mills operating along the west side of Saint Anthony Falls on the Mississippi River in Minneapolis, Minnesota. Cadwallader C. Washburn acquired the company shortly after its founding and hired his brother William D. Washburn to assist in the company's development. In 1866 the Washburns got into the business themselves, building the Washburn "B" Mill at the falls. At the time, the building was considered to be so large and output so vast that it could not possibly sustain itself. However, the company succeeded, and in 1874 he built the even bigger Washburn "A" Mill. In 1877, the mill entered a partnership with John Crosby to form the Washburn-Crosby Company, producing Winter Wheat Flour. That same year Washburn sent William Hood Dunwoody to England to open the market for spring wheat. Dunwoody was successful and became a silent partner. In 1878, the "A" mill was destroyed in a flour dust explosion along with five nearby buildings. The ensuing fire led to the death of 18 workers. Construction of a new mill began immediately. Not only was the new mill safer but it also was able to produce a higher quality flour after the old grinding stones were replaced with automatic steel rollers, the first ever used. In 1880, Washburn-Crosby flour brands won gold, silver and bronze medals at the Millers' International Exhibition in Cincinnati, causing them to launch the Gold Medal flour brand. In 1924, the company acquired a failing Twin Cities radio station, WLAG, renaming it WCCO (from Washburn-Crosby Company). General Mills itself was created in June 1928 when Washburn-Crosby President James Ford Bell merged Washburn-Crosby and 28 other mills. In 1928, General Mills acquired the Wichita Mill and Elevator Company of the industrialist Frank Kell of Wichita Falls, Texas. With the sale, Kell acquired cash plus stock in the corporation. The newly merged company paid a dividend in 1928, and has continued the dividend uninterrupted since then–one of only a few companies to pay a dividend every year since then. Beginning in 1929, General Mills products contained box top coupons, known as Betty Crocker coupons, with varying point values, which were redeemable for discounts on a variety of housewares products featured in the widely distributed Betty Crocker catalog. The coupons and the catalog were discontinued by the company in 2006. A similar program, Box Tops for Education, in which coupon icons clipped off various General Mills products can be redeemed by schools for cash, started in 1996 and is still active. General Mills became the sponsor of the popular radio show The Lone Ranger in 1941. The show was then brought to television, and, after 20 years, their sponsorship came to an end in 1961. Beginning in 1959, General Mills sponsored the Rocky and His Friends television series, later known as The Bullwinkle Show. Until 1968, Rocky and Bullwinkle were featured in a variety of advertisements for General Mills. General Mills was also a sponsor of the Saturday-morning cartoons from the Total TeleVision productions studio, including Tennessee Tuxedo. The company also was a sponsor of the ABC western series The Life and Legend of Wyatt Earp, starring Hugh O'Brian. In 1946, General Mills established their Aeronautical Research Division with chief engineer Otto C. Winzen. This division developed high altitude balloons in conjunction with the United States Navy Office of Naval Research (ONR), such as the Skyhook balloon. The General Mills Electronics division developed the DSV Alvin submersible, which is notable for being used in investigating the wreck of Titanic among other deep-sea exploration missions. The first venture General Mills took into the toy industry was in 1965. The company bought Rainbow Crafts, which was the manufacturer of Play-Doh. General Mills' purchase of the company was substantial because it brought production costs down and tripled the revenue. General Mills came out with their "Monster Cereals" in the 1970s. The cereals are now produced and sold seasonally around Halloween. In 1970, General Mills acquired a five-unit restaurant company called Red Lobster and expanded it nationwide. Soon, a division of General Mills titled General Mills Restaurants developed to take charge of the Red Lobster chain. In 1980, General Mills acquired the California-based Good Earth health food restaurant chain. GM eventually converted the restaurants into other chain restaurants they were operating, such as Red Lobster. In 1982, General Mills Restaurants founded a new Italian-themed restaurant chain called Olive Garden. Another themed restaurant, China Coast, was added before the entire group was spun off to General Mills shareholders in 1995 as Darden Restaurants. During the same decade, General Mills ventured further, starting the General Mills Specialty Retail Group. They acquired two clothing and apparel companies, Talbots and Eddie Bauer. The acquisition was short-lived. Talbots was purchased by a Japanese company, then known as JUSCO, and the Spiegel company purchased Bauer. Spiegel later declared bankruptcy, yet Bauer still remains, albeit in a smaller presence in the United States today. From 1976 to 1985, General Mills went to court as the parent company of Parker Brothers, which held the rights on the brand name and gaming idea of the board game Monopoly, claiming that the so-called Anti-Monopoly game of an economics professor infringed their trademark. The dispute extended up to the U.S. Supreme Court, which ruled against them, saying that while they have exclusive rights to the game Monopoly, they can not prevent others from using the word "monopoly" in the name of a game. In 1985, General Mills' toy division was separated from its parent as Kenner Parker Toys, Inc. There were many potential acquirers of the business but it was floated on the stock exchange with General Mills' shareholders getting equivalent shares in Kenner Parker. This was more tax efficient for General Mills. In 1990, a joint venture with Nestlé S.A. called Cereal Partners was formed which markets cereals (including many existing General Mills cereal brands) outside the US and Canada under the Nestlé name. In 2001, the company purchased Pillsbury (sans Burger King) from Diageo, although it was officially described as a "merger". Since 2004, General Mills has been producing more products targeted to the growing ranks of health-conscious consumers. The company has chosen to switch its entire breakfast cereal line to whole grain. The company also started manufacturing their child-targeted cereals with less sugar. General Mills has reduced the level of sugar in all cereals advertised to children to 11 grams per serving. The company's recent marketing to children included the advergame Millsberry, a virtual city that included games featuring General Mills products. The site launched in August 2004 and ran through December 2010. In April 2011, General Mills announced that it will switch all 1 million eggs it uses each year to cage-free. General Mills was ranked #181 on the 2012 Fortune 500 list of America's largest corporations, 161 in 2015 and was the third-largest food consumer products company in the United States. 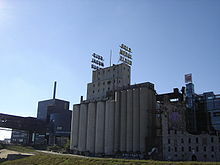 During June 2012, the company's vice-president for diversity stated that General Mills opposes a Minnesota amendment banning gay marriage, stating that the company values "inclusion". The company received positive feedback for its stand which might attract people to its global workforce. The company announced in September 2014 that it would acquire organic food producer Annie’s Inc. for a fee of around $820 million, as part of its strategy to expand in the US natural foods market. In October 2014, General Mills announced plans to cut 700 to 800 jobs, mostly in U.S., in corporate restructuring planned to be completed by the end of 2015. In 2015, citing climate change, General Mills promised to reduce its greenhouse gas emissions by 28 percent over 10 years. In December 2016, the company announced it would be restructuring, splitting into four business groups based on global region, and cutting as many as 600 jobs. In February 2018, the company entered into the pet products industry, paying $8 billion to buy Blue Buffalo Pet Products, Inc. As of 2018, the company ranked 182nd on the Fortune 500 list of the largest United States corporations by revenue. 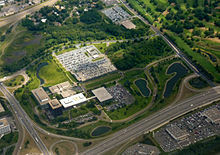 General Mills' corporate campus in Golden Valley, Minnesota. 1930s: General Mills engineer, Thomas R. James, creates the puffing gun, which inflates or distorts cereal pieces into puffed up shapes. This new technology was used in 1937 to create Kix cereal and in 1941 to create Cheerioats (known today as Cheerios). 1939: General Mills engineer Helmer Anderson creates the Anderson sealer. This new device allowed for bags of flour to be sealed with glue instead of just being tied with a string. 1956: General Mills creates the tear-strip for easily opening packages. In April 2014, the company announced that it had changed its legal terms on its website to introduce an arbitration clause requiring all disputes with General Mills to be resolved in small claims court or arbitration and not as a participant in a class action. The change was made shortly after a judge's March 26, 2014, denial of a motion to dismiss a class action regarding the marketing of the company's Nature Valley brand products. Users would be deemed to accept the terms by interacting with General Mills on its website in various ways, such as downloading coupons, subscribing to newsletters, or participating in Internet forums hosted on the website. The New York Times stated that the agreement could be interpreted to additionally construe purchasing General Mills products at a grocery store or liking the company's Facebook page as assent to the terms; General Mills disclaimed that interpretation, calling it a "mischaracterization". The change in terms resulted in a massive backlash of protests via consumer groups and social media, and General Mills reverted the terms back to the original content after only a few days. Some brands are marketed outside the US and Canada by the Cereal Partners joint venture using the Nestlé brand. It also produces fruit snacks, including Fruit by the Foot, Fruit Gushers, Fruit Roll-Ups, and Fruit Shapes. It also produces organic foods, via Cascadian Farm, which they took over when they bought Small Planet Foods, and Muir Glen. More recently, as of 2014, it has purchased Annie's Homegrown. Other company brands include Annie's, Blue Buffalo, Frescarini, Latina, Totino's, Jeno's, Progresso, Colombo, and Yoplait (51%). It also produces Häagen-Dazs ice cream outside of the US. General Mills acquired the meat-based brand Epic Provisions in 2016. As of 25 May 2008[update], 79 facilities for the production of a wide variety of food products were in operation. Of these facilities, 49 are located in the US, 12 in the Asia/Pacific region (8 of which are leased), 5 in Canada (2 of which are leased), 7 in Europe (3 of which are leased), 5 in Latin America and Mexico, and one in South Africa. The company also has a Global Business Solutions (GBS) division in Mumbai, India. Its prominent brand in India is Pillsbury although it has opened a premium ice cream parlour of Häagen-Dazs ice cream in Delhi and Mumbai. In 2016 General Mills moved its UK Jus-Rol operations to Greece. ^ a b c d e f "General Mills, Inc. 2017 Annual Report (Form 10-K)". sec.gov. U.S. Securities and Exchange Commission. June 2017. ^ "Nourishing Lives". General Mills. ^ "Mill City Timeline". millcitymuseum.org. Retrieved September 13, 2014. ^ "The Story of a Grain of Wheat". Angelfire. ^ "Washburn 'A' Mill Explosion". History Topics. Minnesota Historical Society. Retrieved May 9, 2012. ^ Gray, James (1954). Business without Boundary: The Story of General Mills. University of Minnesota Press. p. 36. LCCN 54-10286. ^ a b "General Mills 150 - Making Food People Love". GeneralMills.com. Retrieved April 5, 2016. ^ "J. W. Williams, "Frank Kell"". tshaonline.org. Retrieved April 16, 2013. ^ General Mills Inc. "Box Tops for Education Homepage". ^ "Whatever Happened to Total TeleVision productions?". Hogan's Alley. ^ "The "daddy" of the balloon industry". Taste of General Mills blog. General Mills. Retrieved December 15, 2015. ^ "Our connection to Alvin". Taste of General Mills blog. General Mills. Retrieved December 15, 2015. ^ Morioka, Lynne (Aug 20, 2013). "The return of two General Mills monsters". Retrieved March 26, 2014. ^ "General Mills announces purchase of Good Earth Restaurant chain". Lakeland Ledger. Nov 8, 1980. ^ Akst, Daniel (March 11, 1986). "Brothers Plan Growth for Good Earth Chain - Los Angeles Times". Articles.latimes.com. Retrieved June 5, 2013. ^ "February Openings Set For Theme Restaurants". The Daytona Beach News-Journal. October 9, 1982. ^ Ward, Arthur(2009), The Boys' Book of Airfix London: Ebury Press (Ebury Publishing). ^ a b "About us – Nestle Cereals". Cereal Partners UK. Archived from the original on February 26, 2012. ^ Horovitz, Bruce (September 30, 2004). "Cereals go whole grain". USA Today. Retrieved May 3, 2010. ^ "General Mills: Our History". General Mills. ^ "General Mills to Cut Sugar in Kids' Cereals". Alegent Health System. ^ "General Mills Announces New Cage-Free Egg Commitment" (Press release). Humane Society. April 20, 2011. Retrieved March 26, 2014. ^ "Fortune 500 – Full List". Fortune. Retrieved May 9, 2012. ^ "Fortune 500 – Industries". Fortune. Retrieved May 9, 2012. ^ Staff (June 14, 2012). "General Mills against amendment banning gay marriage". MSNBC. Retrieved August 24, 2012. ^ Brucato, Cyndy (June 18, 2012). "Why General Mills didn't get hammered for speaking out on marriage amendment". MinnPost.com. Retrieved August 24, 2012. ^ "General Mills plans to cut about 700 to 800 jobs". USA Today. Retrieved October 1, 2014. ^ "General Mills announces new commitment on climate change" (Press release). General Mills. August 30, 2015. Retrieved September 4, 2015. ^ Behr, Jonathan (September 3, 2015). "Why General Mills is tackling global warming". CBS News. Retrieved September 4, 2015. ^ "General Mills Plans to Cut 600 Jobs in Global Restructuring". Fortune. December 5, 2016. Retrieved December 9, 2016. ^ Giammona, Craig (February 23, 2018). "General Mills Pays Steep Price to Get Into High-Growth Business". Bloomberg. Retrieved February 23, 2018. ^ "Fortune 500 Companies 2018: Who Made the List". Fortune. Retrieved 2018-11-22. ^ "General Mills: Biographies". General Mills. ^ a b Strom, Stephanie (April 16, 2014). "When 'Liking' a Brand Online Voids the Right to Sue". The New York Times. Retrieved July 8, 2014. ^ a b Weiss, Debra Cassens (April 17, 2014). "Buying a General Mills product eliminates the right to sue, according to online legal terms". ABAJournal. American Bar Association. Retrieved July 8, 2014. ^ Sherman, Erik (April 18, 2014). "General Mills adds legal fine print that raises questions". CBS News. Retrieved July 8, 2014. ^ a b Strom, Stephanie (April 17, 2014). "General Mills Amends New Legal Policies". New York Times. Retrieved July 8, 2014. ^ Gray, Jeff (April 19, 2014). "General Mills abandons controversial legal policy to strip consumers of rights". The Globe And Mail. Retrieved July 8, 2014. ^ Foster, Kirstie (April 19, 2014). "We've listened – and we're changing our legal terms back". generalmills.com. General Mills. Retrieved December 9, 2014. ^ Murphy, Esme (April 20, 2014). "Talking Points: General Mills Reverses Lawsuit Change". CBS Minnesota. WCCO-TV. Retrieved July 8, 2014. ^ Gregory Wallace (December 8, 2014). "French Toast Crunch cereal is back". CNNMoney. ^ "Peanut Butter Toast Crunch Cereal - MrBreakfast.com". ^ 1965 General Mills Banana Wackies cereal TV commercial (15 seconds). March 19, 2013 – via YouTube. ^ 1972 Baron Von Redberry cereal w/iron-on patches promotion TV commercial. April 8, 2012 – via YouTube. ^ "Benefit Cereal - MrBreakfast.com". ^ a b c "A Tribute to Discontinued Cereals". Gunaxin Grub. ^ "Bunuelitos Cereal - MrBreakfast.com". ^ 1986 General Mills Circus Fun cereal commercial. July 2, 2011 – via YouTube. ^ VINTAGE TV COMMERCIAL - CLACKERS CEREAL - MAN TRYING TO KARATE CHOP A CLACKERS BOX. November 30, 2011 – via YouTube. ^ "Clusters Cereal - MrBreakfast.com". ^ Country Corn Flakes Commercial (1963). September 12, 2008 – via YouTube. ^ 1978 Crazy Cow Cereal TV commercial. November 8, 2011 – via YouTube. ^ 1986 General Mills Crispy Wheats 'n Raisins cereal commercial. July 2, 2011 – via YouTube. ^ a b c d e f g h i "54 Cereals We Loved and Lost - A Tribute". Urlesque. Archived from the original on March 2, 2012. ^ FROSTY O'S CEREAL COMMERCIAL 1966. March 15, 2010 – via YouTube. ^ FRUIT BRUTE! The First one!. July 19, 2009 – via YouTube. ^ First Yummy Mummy!. May 23, 2009 – via YouTube. ^ 1959 General Mills Cereal Commercials Rocky and Bullwinkle 2. January 14, 2014 – via YouTube. ^ "Harmony Cereal - MrBreakfast.com". ^ a b c d "26 Cereals From The '90s You'll Never Be Able To Eat Again". BuzzFeed. ^ "Millenios Cereal - MrBreakfast.com". ^ "Chiller - Scary Good". ^ "Neopets Islandberry Crunch Cereal - MrBreakfast.com". ^ Pac-Man cereal commercial (early 80's). December 14, 2006 – via YouTube. ^ "Princess Fairytale Flakes Cereal - MrBreakfast.com". ^ "Star Wars Episode II Cereal - MrBreakfast.com". ^ 1964 Sugar Jets cereal TV commercial (15 seconds). January 22, 2013 – via YouTube. ^ "Sunrise Cereal - MrBreakfast.com". ^ 1960's General Mills Twinkles Cereal and Cartoon Commercial. May 13, 2013 – via YouTube. ^ "USA Olympic Crunch Cereal - MrBreakfast.com". ^ "Wheat Stax Cereal - MrBreakfast.com". ^ "General Mills, craving organic meat snacks, buys Epic Provisions". TheStreet. Retrieved March 5, 2016. ^ General Mills SEC Form 10K, filed July 11, 2008. ^ "FORM 10-K". Sec.gov. Retrieved February 9, 2014.